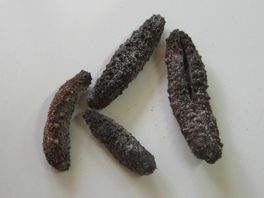 A sea cucumber (trepang) processor, of the Holothuria Scabra specie, from Madagascar, asked for Oceatec's consulting services advice to improve the product quality. Oceatec team of expert in seafood processing undertook an evaluation of the product and of the process, and proposed a course of action aimed at improving the cleaning process in place at the processing facility. This intervention allowed the processor to permanently solve the product quality problems and to improve significantly its value on the market. Oceatec can provide positive solutions no matter where your processing plant is located. Contact us to discuss your next product or process improvement project. Oceatec can also provide assistance in setting-up drying systems and in the processing of other sea cucumber species.